HA5-12G is AJA’s HDMI 2.0 to 12G-SDI mini-converter. The HDMI input is converted to 2x 12G-SDI single link outputs for driving 12G-SDI monitoring solutions, routing and more with single cable simplicity for 4K/UltraHD/2K/HD workflows. Up to eight channels of HDMI audio or two channels of analog audio may be embedded into the SDI output signals when selected. 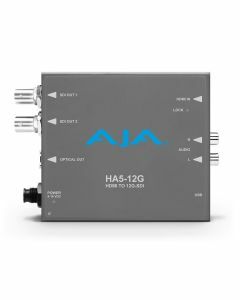 HA5-12G models are AJA’s HDMI 2.0 to 12G-SDI Mini-Converters. The HDMI 2.0 input is converted to 12G-SDI output for driving SDI monitoring solutions. HA5-12G models with included Fiber LC SFPs expand your reach to 10km (Single Mode) and provide simultaneous coaxial and fiber support, serving as a cost effective DA for 12G-SDI workflows from a single HDMI 2.0 source. *HA5-12G devices use approximately 11 watts of power and convection cooling. They will be warm to the touch, which is normal. When installing a unit, mount in a location where the device has access to air for proper cooling. Do not stack a HA5-12G device with other Mini-Converters.